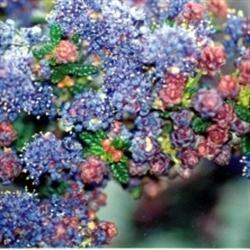 Ceanothus 'Dark Star' is a compact shrub growing to about 6 feet tall by 8 feet wide. The leaves are small, rough-textured and dark green. In spring the dark cobalt-blue flower clusters with yellow stamens give the impression of a starry night (hence the name). Plant in full sun in well draining soil. 'Dark Star' requires little or no water in summer. It is hardy to 5 degrees F. This Ceanothus impressus hybrid is one of the showiest of the California Lilacs, but has a reputation for being fussy in inland gardens. We have it planted here inland and have been very happy with its performance.